Autoimmune diseases develop in selected normal mouse strains when thymectomy (Tx) is performed at 3 days of age (d3-Tx). Insufficient T cell regulation after Tx may result from a defect in regulatory T (Treg) cells or from an augmented effector T (Teff) cell number/pathogenicity. We have previously shown that Tx at 3 wk (wk3-Tx), the age of massive islet Ag release, accelerates diabetes onset. We now have determined diabetes incidence in d3-Tx nonobese diabetic mice and compared the frequency and function of their Teff and Treg cells with those of wk3-Tx mice. We found that d3-Tx had no effect on diabetes incidence, but induced gastritis. After day 3 and week 3 Tx, Treg cells were fully competent and their frequency increased. The number of diabetogenic T cells was greatly amplified after wk3-Tx and likely overcame Treg cell control, leading to an early tolerance breakdown. By contrast, in d3-Tx mice, activation concerned few cells and Teff cell amplification remained controlled. This suggests that Tx enhances autoimmunity when it coincides with the first encounter of autoreactive T cells with their cognate Ag. The relationship between Tx-induced lymphopenia, tissue remodeling, and autoimmunity is discussed. Autoimmunity is often associated with lymphopenic conditions (1, 2). Notably, thymectomy (Tx)3 at 3 days of age (d3-Tx), in addition to a severe T cell lymphopenia, induces autoimmune diseases, such as gastritis, thyroiditis, or oophoritis, in selected mouse strains that are not genetically prone to autoimmunity (3, 4). Insulitis and type 1 diabetes have not been reported in any of the normal mouse strains subjected to d3-Tx. Recent thymic emigrants undergo homeostatic proliferation in neonates (5, 6). It is well established that such proliferation is IL-7 dependent for the vast majority of T cells, and self-peptide/self-MHC dependent for a minority subset. Thus, self-recognition events induce strong proliferation (or spontaneous proliferation) of the infrequent autoreactive T cells present in normal individuals, and those with high-affinity receptors may become aggressive, notably if secondary factors favor autoimmunity development (7, 8, 9, 10). It was first hypothesized that d3-Tx-induced autoimmune pathologies resulted from a deficiency in natural CD4+Foxp3+ T regulatory (Treg) cells, whose initial export from the thymus was thought to be delayed, compared with conventional T cells (4). However, more recent studies showed that Treg cells are present in the periphery of 3-day-old mice, expand after Tx, becoming even more frequent than in unmanipulated mice while retaining their suppressive activity (11). Thus, in susceptible mouse strains, the emergence of autoimmune disorders after d3-Tx may indicate that, following spontaneous proliferation, the strength of the effector arm of the autoimmune reaction is such that Treg cells cannot fully control this reaction. A relationship between lymphopenia and autoimmune diabetes has been evoked. The diabetes-prone BioBreeding rat (DP-BB) and the nonobese diabetic (NOD) mouse develop autoimmune diabetes characterized by T cell-dependent destruction of insulin-producing β cells in the pancreas. The DP-BB rat exhibits a severe T cell lymphopenia (12), and a recent study indicates that the state of lymphopenia may be a factor that drives the development of autoimmune diabetes in some (13) but not all NOD mouse colonies (14, 15). We previously demonstrated that Tx at 3 wk (wk3-Tx), but not at 6 wk, precipitates the onset of diabetes. Interruption of thymic export at 3 wk induces a significant reduction in the T cell pool and, consequently, CD4+ T cell proliferation (16), but the mechanisms involved in diabetes acceleration remain unclear. Breakdown of tolerance to islet cell Ags during the natural development of diabetes has been ascribed to the genetic lack of RT6+ Treg cells in DP-BB rats (17) and to the age-dependent decline of Treg cell function in NOD mice (18, 19). Failure of Treg cells was also assigned for the exacerbated autoimmunity observed in lymphopenic d3-Tx mice (4). However, decline of Treg cell activity may not be the only factor affecting autoimmunity in genetically diabetes-susceptible mice (20, 21), and pathogenic T cell behavior should be considered. It was intriguing that, in NOD mice, Tx affected diabetes onset when performed as late as 3 wk, while in control mice, autoimmune disorders required Tx to be performed during the first week of life. This paradox may relate to the respective implication of effector T (Teff) and Treg cell compartments in the tolerance breakdown ensuing Tx. To better appraise the fate of Teff and Treg cells in Tx-induced autoimmunity in autoimmune-prone NOD mice, the consequences of thymus ablation at 3 days were determined in comparison to wk3-Tx. NOD and NOD-scid mice were bred under specific pathogen-free conditions. Recipients of diabetogenic T cells were NOD-scid mice aged 4–6 wk. Diabetic mice were pooled and used within the week following disease onset. This study was approved by the local ethics committee on animal experimentation. The following Abs and reagents were used purified or conjugated to biotin or to a fluorochrome (FITC, PE, PerCP, allophycocyanin, allophycocyanin-Cy7, or PerCP-Cy7): anti-CD62L, anti-CD3, anti-CD11b, anti-CD45R/B220, anti-CD4, anti-CD8, anti-Ly76, anti-CD25, anti-CD103, anti-CTLA-4, anti-glucocorticoid-induced TNFR-related protein (GITR), streptavidin, (BD Pharmingen/BD Biosciences), and anti-mouse Foxp3 (eBioscience). Cells from spleen, peripheral lymph nodes (perLN), pancreatic lymph nodes (PLN), and mesenteric lymph nodes (MLN) were preblocked using purified anti-CD16/32 and then sequentially stained with biotin- or fluorochrome-labeled Abs, and with streptavidin conjugated to the appropriate fluorochrome. Intracellular Foxp3 staining was performed according to the manufacturer’s protocol. Analysis was performed using a FACSCalibur and CellQuest software or a FACSAria and Diva software (BD Biosciences). Three-week-old mice were thymectomized by the suction technique. The thymus of 3-day-old pups was removed as previously described (4). Sham-operated animals (sham-Tx) were used as controls. Mice with residual thymi were excluded from experiments. To isolate CD4+ cells, spleen and lymph node (LN) cells were labeled with a mixture of biotinylated anti-CD8, anti-Mac-1, anti-B220, and TER-119 Abs followed by streptavidin microbeads and separated using a VarioMACS device (Miltenyi Biotec). From the nonretained cells (90–95% CD4+), Treg cells were enriched using biotinylated anti-CD25 (7D4) and streptavidin microbeads. FACS analysis of the retained cells stained with FITC-anti-CD4 and PE-anti-CD25 (PC61) reproducibly showed ≥80% CD4+CD25+ cells. The negative fraction contained 90–95% CD4+CD25− cells. The CD4+CD25+ cells were used as such in in vivo experiments and further purified with a FACSVantage cell sorter for in vitro suppression assays. Spleen cells from diabetic mice were enriched in diabetogenic CD62L− T cells by depletion of B, myeloid, and CD62L+ cells. The final cell population contained 70–80% CD62L− T cells. CD4+CD25− and FACS-sorted CD4+CD25+ cells (2.5–5 × 104) were cultured, in RPMI 1640 supplemented with 10% FCS, with 0.5–1 × 105 APCs and purified anti-CD3 (2 mg/ml). Mitomycin-treated spleen cells from NOD Cα−/− were used as APCs. All cultures were set in triplicate in 96-well culture plates and pulsed for the last 18 h of a 3-day culture with 1mCi of [3H]TdR/well (5 Ci/mmol; Amersham Biosciences) to measure proliferation. As diabetogenic T cells are comprised within the CD62L− T cell population (22), each mouse recipient received i.v. 4–5 × 105 CD62L− T cells, unless otherwise mentioned. To test the regulatory function of cell subpopulations, cotransfer experiments were performed. NOD-scid recipients were injected with 5 × 105 diabetogenic CD62L− T cells along with various numbers of test cells. Recipients were tested weekly for glycosuria until 7–16 wk after transfer. Pancreas, stomach, ovaries, and testes were fixed in Bouin’s solution and processed for paraffin embedding. Four sections (5 μm) taken at 100-μm intervals were stained according to the hematein-eosin-safranin method. For gastritis, stomach histological status was simply recorded as − (no mononuclear cells) or + (mild to severe lymphocytic infiltration). Pooled data were computed as mean ± SEM and compared using Student’s t test or one-way ANOVA. The incidence of diabetes was studied using the log-rank test. The cumulative incidence of diabetes in d3-Tx NOD females at 34 wk of age was 9 (45%) of 20 compared with 23 (66%) of 35 for controls. These prevalences were not significantly different (p > 0.05). The first diabetic mouse was diagnosed at 10–11 wk in both groups (Fig. 1⇓A). d3-Tx in NOD mice has no effect on the development of diabetes, but induces gastritis. A, Prevalence of spontaneous diabetes in d3-Tx and sham-Tx female NOD mice. B, Analysis of insulitis in 9-wk-old NOD mice. Results from males and females, being similar, were pooled. The frequency of islets with no, peri-islet and intraislet infiltration is shown. ∗, p < 0.05 d3-Tx vs sham-Tx. C, Histological analysis of gastritis in d3-Tx NOD mice aged 8–30 wk. At 12 wk of age, the frequency of healthy islets was significantly increased in d3-Tx mice (94 ± 3.2%) compared with controls (73.2 ± 9.6%; p = 0.01). In 17 (68%) of 25 d3-Tx mice, 100% of their islets were free of infiltrating cells vs 2–60% of the islets in control mice. Retardation of insulitis essentially concerned islets in the process of destruction (1.6 ± 1% in d3-Tx mice vs 16.2 ± 6.4% in controls, p = 0.0005), peri-islet infiltration being similar in both animal groups (Fig. 1⇑B). As reported in BALB/c mice, d3-Tx induced gastritis in NOD mice and its frequency tended to increase with age (Fig. 1⇑C). Ovaries and testes remained free of mononuclear cell infiltrates, and d3-Tx NOD mice did not develop a wasting syndrome as observed in other mouse strains (data not shown) (23). Our results indicate that d3-Tx induced gastritis but did not accelerate diabetes onset and even delayed the development of insulitis. First, we investigated the time course of lymphocyte subsets in the blood of d3-Tx mice over an 8-wk period. After d3-Tx, the frequency of circulating CD4+ and CD8+ cells was significantly decreased, while the proportion of B cells was increased (Fig. 2⇓A). d3-Tx in NOD mice results in severe lymphopenia. A, Time course evolution of lymphocyte subsets in the blood of thymectomized and control mice from 3 to 8 wk after surgery. B, Frequency and absolute numbers of T and B lymphocytes in the spleen and perLN of 12-wk-old NOD mice. ∗, p < 0.05 d3-Tx vs sham-Tx. Spleen and perLN cells of the same mice were analyzed at 12 wk (Fig. 2⇑B). d3-Tx resulted in a significant reduction in the total cell number in the spleen (50%) and the perLN (75%; data not shown). Changes in the frequencies of T and B cells, due to Tx, were comparable to those observed in the blood. Given the severe reduction of the peripheral organ cellularity, the absolute numbers of T lymphocyte subsets were significantly diminished in both organs, but B cell numbers remained unchanged (Fig. 2⇑B). Analyses of wk3-Tx mice at 9 wk of age, in agreement with earlier results (15), showed that the cellularity of spleens was not significantly modified compared with sham-Tx mice, while total cell numbers of perLN exhibited a 30–50% reduction (data not shown). Analysis of the CD4+ T cell pool showed that in sham-Tx mice, CD4+ cells were 2-fold more numerous than in wk3-Tx mice and 4-fold more numerous than in d3-Tx (Fig. 3⇓B). Comparative analysis of regulatory CD4+Foxp3+ T cells in 7- to 9-wk-old control and thymectomized mice. Cells from spleen, perLN, PLN, and MLN were analyzed. Cells were surface stained for CD4 and CD25, followed by intracellular staining for Foxp3, and analyzed by flow cytometry. A, Expression of Foxp3 and CD25 on gated CD4 T cells. B, Frequency and absolute numbers of conventional and regulatory CD4 T cell subsets. Mean ± SEM corresponds to 12 sham-Tx, 7 wk3-Tx, and 6 d3-Tx mice for all organs, except for MLN which results from five sham-Tx, two wk3-Tx, and four d3-Tx mice. One-way ANOVA was used for statistical analysis. p < 0.05: ∗, wk3-Tx vs sham-Tx; #, d3-Tx vs sham-Tx; and §, wk3-Tx vs d3-Tx. The numbers of T cells were more affected in perLN than in spleen likely because both d3-Tx and wk3-Tx mice harbored more cells expressing an activated cell phenotype, in particular, low levels of CD62L (see below and Ref. 16) required for LN homing. Next, we analyzed CD4+Foxp3+ Treg cells in 7- to 9-wk-old mice. A significant increase in Foxp3+ cell frequency among CD4+ cells was observed in all organs tested of both Tx mice (Fig. 3⇑, A and B). This increase was more important after d3-Tx than after wk3-Tx and less important in PLN and MLN than in perLN and spleen of wk3-Tx mice. Consequently, the reduction of the absolute number of CD4+Foxp3+ cells was moderate in the spleen and perLN (no reduction in other LNs) of wk3-Tx mice, but severe after d3-Tx in all organs (Fig. 3⇑B). The two CD4+Foxp3+ Treg subsets, defined by the expression of high level or low level/lack of CD25, were further analyzed. Interestingly, the frequencies in Foxp3+CD25+ cells among CD4+ cells were similarly increased in all organs of wk3- and d3-Tx mice. Thus, the differences in frequencies of total Foxp3+ cells observed between both thymectomized mice were essentially ascribable to a greater increase in the percentage in Foxp3+CD25− cells of d3-Tx mice. 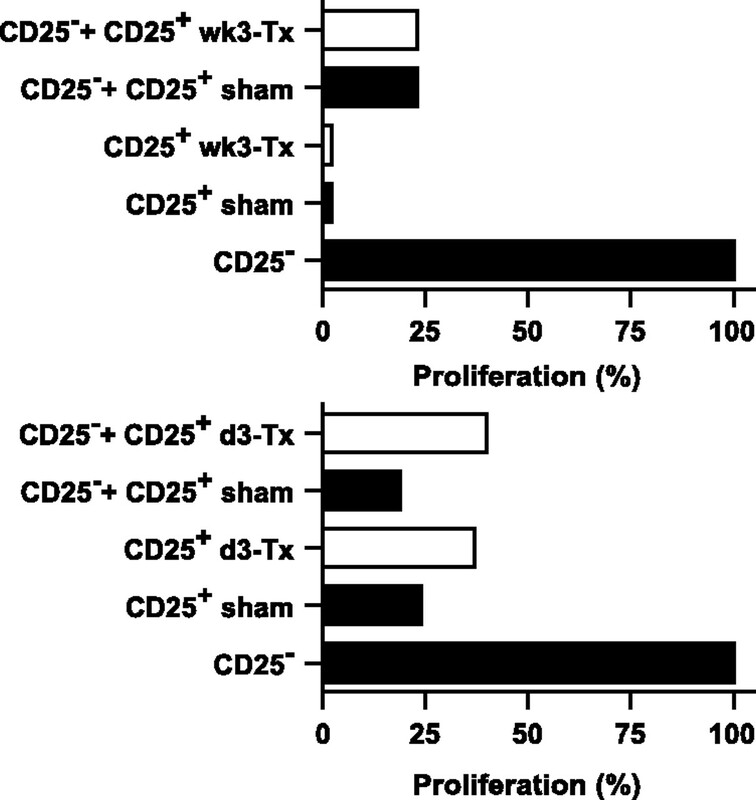 Notably, as opposed to control and wk3-Tx mice, Foxp3+CD25− cells were more frequent than their Foxp3+CD25+ counterparts in the spleen of d3-Tx mice. When results were expressed as absolute numbers of cells, it appeared that in wk3-Tx and control mice that the size of the Foxp3+ subsets was not significantly reduced, whereas after d3-Tx, Foxp3+CD25+ and Foxp3+CD25− cell numbers were reduced 3- to 5-fold and 2- to 3-fold, respectively (Fig. 3⇑B). In brief, d3-Tx mice exhibited a decreased CD25+:CD25− ratio among Foxp3+ cells. Next, to further characterize the phenotype of CD4+Foxp3+ T cells, we analyzed the two subsets of CD4+Foxp3+ cells identified according to the levels of expression of several markers that differentiate naive (CD103−CTLA-4−CD62L+GITRlow/− cells) from activated/memory (CD103+CTLA-4highCD62L−/lowGITRhigh cells) Treg cells (24, 25, 26). To examine the consequences of thymus ablation on the phenotype of CD4+Foxp3+ cells, FACS analyses of spleen, perLN, MLN, and PLN cells of 7- to 9-wk-old mice were performed, and Fig. 4⇓A shows that of perLN. Analysis of CD4+Foxp3+ and CD4+Foxp3− cells in 7- to 9-wk-old control and Tx mice. A, The increase in the frequency of Treg cells with an effector/memory-like phenotype is more important after d3-Tx than after wk3-Tx. Cells from the organs shown in Fig. 3 were stained for CD4, CD25, CD103, CTLA4, Foxp3, and CD62L or GITR and analyzed with a FACSAria. Representative dot plots show gated CD4+Foxp3+ cells from peripheral LNs. Similar results were observed in the other organs. Numbers indicate the frequency of cells within each quadrant. B, Frequency of conventional CD4 cells expressing an activated/memory phenotype in the spleen. 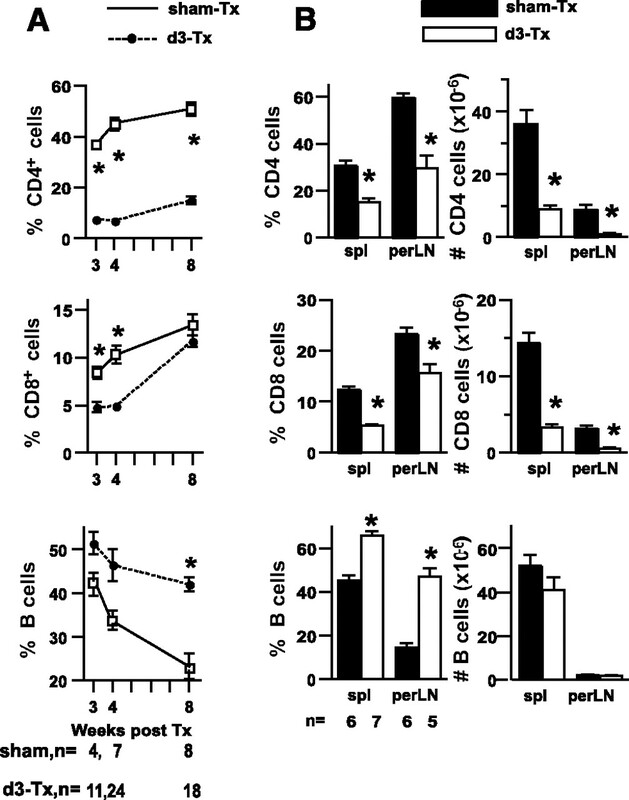 C, Absolute numbers of activated Treg and conventional CD4+ cells in the spleen and the LNs of control and Tx mice. As already reported after wk3-Tx (27), d3-Tx led to an important increase in the frequency of CD4+Foxp3+CD103+ cells. This increase was significantly higher in d3-Tx mice (∼3-fold) than in wk3-Tx mice (≤2-fold). The frequency of activated cells among CD4+Foxp3+ Treg cells was on average <20% in control mice, 30% in wk3-Tx mice, and 50% in d3-Tx mice (Fig. 4⇑A). However, the absolute numbers of the activated CD103+CTLA-4highCD62L−/lowGITRhigh Treg cells remained roughly unchanged in the three groups of mice, except in the spleen of wk3-Tx mice where their frequency was increased (Fig. 4⇑C). Activated/memory CD62L− conventional T cells are more frequent in the spleen than in the LNs and concentrate diabetogenic T cells (22). Analysis of the activated/memory conventional CD4+CD62L−Foxp3− T cells showed a ≥2-fold increase in their frequency in the spleen of both thymectomized groups (Fig. 4⇑B) and in the LNs of d3-Tx mice only (data not shown). 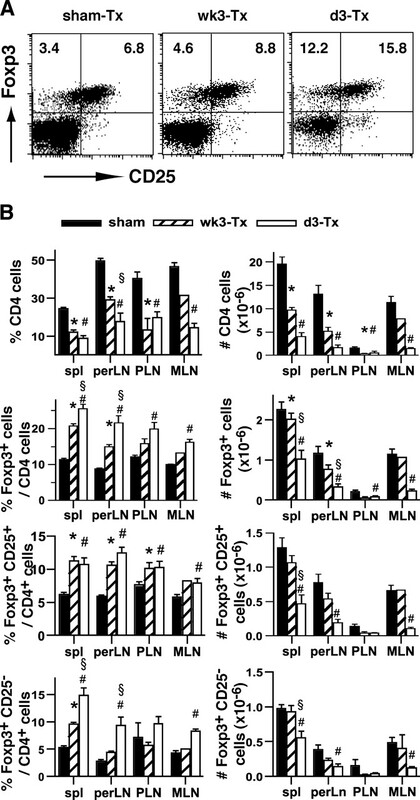 In contrast, the absolute number of CD4+CD62L−Foxp3− cells in wk3-Tx mice was unchanged, but almost 3-fold decreased in the spleen of d3-Tx mice compared with sham-Tx mice (Fig. 4⇑C). The memory conventional CD4 cells:memory Treg cells ratio (Fig. 4⇑C) and the conventional CD4 cells:total Treg cell ratio (data not shown) show that, after both Tx, the relative proportion of Treg cells was 2-fold increased. These results suggest that the acceleration of diabetes onset after wk3-Tx may not result from a numerical defect in Treg cells. The function of Treg cells was first tested in vitro. As their normal counterparts, CD4+CD25+ cells from adult wk3-Tx and d3-Tx mice did not respond to soluble anti-CD3 stimulation and were able to suppress the proliferative response of CD4+CD25− cells in vitro (Fig. 5⇓). Treg cells from both adult wk3- and d3-Tx mice are functional in vitro. Purified CD4+CD25+ cells (5 × 104) from wk3-Tx (upper graph) and from d3-Tx (lower graph) mice aged 8 wk were cultured with CD4+CD25− T cells (2.5 × 104) from normal mice, APCs, and anti-CD3. Treg cells from sham Tx mice were used as control cells. Second, in cotransfer experiments, CD4+CD25+ cells from wk-3Tx mice protected from diabetes transfer as efficiently as their control mouse counterparts (Fig. 6⇓A). Thus, the early onset of diabetes in wk3-Tx mice may not be related to a dysfunction of Treg cells. Treg cells from both adult wk3- and d3-Tx mice are functional in vivo. A, CD4+CD25+ cells from wk3-Tx NOD mice aged 7–8 wk protected against diabetes transfer as well as Treg cells from sham-Tx mice. NOD-scid recipients (10 mice/group) were injected with diabetogenic CD62L− T cells (5 × 105) alone (p ≤ 0.0002 compared with each mixture of pathogenic and Treg cells) or along with 2 × 106 CD4+CD25+ cells from Tx or sham-operated mice (p > 0.05 sham vs Tx mice). Data from two experiments were pooled. B, T cells from d3-Tx mice, aged 11 wk, harbored diabetes-suppressor T cells. Recipients (5 mice/group) received diabetogenic cells alone (p = 0.003 compared with each mixture of pathogenic and Treg cells) or mixed with 15 × 106 T cells from either d3-Tx or sham-operated mice (p > 0.05 sham vs Tx mice). Due to the scarcity of Treg cells in the spleen of adult d3-Tx mice, we could not directly test these cells in vivo. However, total T cells from d3-Tx NOD mice protected against diabetes transfer as well as T cells from control mice (Fig. 6⇑B). Thus, in d3-Tx mice, T cells exhibited a suppressive activity against diabetes transfer. Both d3- and wk3-Tx mice harbored cells with a protective activity against diabetes development as efficient as that of control mice. However, the rate of diabetes onset was normal in d3-Tx mice and accelerated in wk3-Tx mice. This may result from a differential expansion of diabetogenic T cells. We tested diabetogenic spleen T cells in diabetes transfer experiments. In such experiments, the more diabetogenic T cells are injected, the earlier diabetes is diagnosed. However, a 3- to 4-wk time lag between cell injection and diabetes onset is required. The rates of diabetes onset after transfer of 10 × 106 spleen T cells from 8-wk-old female sham- and d3-Tx mice were similar, but much slower than with cells from diabetic mice (Fig. 7⇓A). Using 30-wk-old donors, we confirmed that diabetogenic T cells from control and d3-Tx mice caused diabetes with similar kinetics (data not shown). Thus, the comparable incidences of diabetes in d3-Tx and control mice correlate with similar pathogenicity of anti-β cell T cells. Diabetogenic T cell activity is exacerbated in wk3-Tx but not in d3-Tx mice. A, CD62L− T cells (0.5 × 106) from overtly diabetic mice and 10 × 106 T cells from 8-wk-old d3- and sham-Tx mice were injected into NOD-scid recipients (5 mice/group). B, Upper graph, CD62L− T cells (0.4 × 106) from overtly diabetic mice or CD25− T cells (2 × 106) from 8-wk-old wk3-Tx and sham-Tx mice were injected into NOD-scid recipients (10 mice/group). Lower graph, Two doses of CD62L− T cells (5 × 104 and 106) from 8-wk-old wk3-Tx and sham-Tx mice were transferred into NOD-scid recipients (5 mice/group). For both doses, p < 0.05 sham vs Tx mice. Transfer of diabetes with CD25− T cells from 8-wk-old wk3-Tx mice showed an accelerated onset of diabetes compared with control cell transfer (Fig. 7⇑B, upper graph). To strengthen this observation, we used two doses of CD62L− T cells that concentrate all diabetogenic T cells. With the larger dose (106 cells), all mice became diabetic but cells from wk3-Tx mice induced diabetes more rapidly than cells from control mice (p = 0.044). When 5 × 104 cells were injected, 100% of the recipients of wk3-Tx cells and only 40% of the recipients of control cells developed diabetes (p = 0.023; Fig. 7⇑B, lower graph). These results indicated that adult d3-Tx and sham-Tx mice harbored equivalent numbers of diabetogenic cells, while the pool of pathogenic T cells was enhanced in wk3-Tx mice. The natural development of autoimmune diabetes in NOD mice involves multiple events among which are defects in the thymic negative selection of β cell-specific T precursors and in Treg function at the periphery (28). Diabetes onset is precipitated or delayed/inhibited under the influence of diverse interventions. We previously showed that wk3-Tx accelerates diabetes development in NOD mice (15). We now report that although Tx of 3-day-old NOD mice induced gastritis, as found in susceptible normal mouse strains, it had no consequence on diabetes prevalence. These observations prompted us to analyze and compare the Teff and Treg cell compartments in euthymic, wk3- and d3-Tx NOD mice. The severity of Tx-induced lymphopenia being related to the size of the T cell pool at the time of surgery, wk3-Tx mice showed a milder lymphopenia than d3-Tx mice. The wk3-Tx-induced lymphopenia concerned essentially naive CD4+ cells, whereas activated/memory and Treg cell numbers remained unchanged, as reported elsewhere (16). D3-Tx induced a severe reduction of all T cell populations. In both thymectomized mouse groups, Treg cells were as efficient as their control mouse counterparts. In wk3-Tx mice, the concentration of diabetogenic T cells among the activated/memory T cell pool was increased, while in d3-Tx mice, it was similar to that in sham-Tx mice. In a lymphopenic environment, mature naive, memory, and Treg cells divide and expand, partially reconstituting the peripheral lymphocyte pool. Two forms of lymphopenia-induced proliferation (LIP) have been described (7, 8). “Homeostatic” T cell proliferation is undergone by the vast majority of injected or residual T cells, is slow, self-MHC independent, and requires IL-7. “Spontaneous” proliferation corresponds to the expansion at a very rapid rate of the rest of T cells, i.e., 5% of T cells in NOD mice (29). Spontaneous proliferation is IL-7 independent, driven by both specific recognition of self-peptide-MHC complexes (30, 31), and by gut-derived microbial Ags (10, 16, 32) and generates the bulk of the T cells recovered when equilibrium is reached (7). Hence, the peripheral T cell pool becomes greatly enriched in autoreactive T cells expressing an activated/memory phenotype, which predisposes to autoimmunity (28, 33, 34, 35). In euthymic normal neonates, a model of transient lymphopenia, peripheral T cells proliferate strongly for more than 10 days (5). d3-Tx amplifies and prolongs this self-Ag-driven proliferation (6, 33, 34). Consequently, activation of the autoreactive T cell repertoire, following neonatal Tx in several nonautoimmune mice, results in organ-specific autoimmunity that can be detected as early as 3 wk after Tx (36). This lymphopenia-associated autoimmunity occurs in mice thymectomized before 7 days of age (37, 38). When Tx is performed in older mice, no signs of autoimmunity emerge. The effects of d3-Tx in mice spontaneously developing organ-specific autoimmune diseases, such as the NOD mouse, have not yet been reported. Breakdown of tolerance to islet-related Ags in NOD mice is evidenced from 4 to 5 wk of age when the first signs of insulitis appear, soon after the initial encounter of Teff cells with their cognate Ag (39, 40, 41). However, activated Teff cells are held in check by Treg cells in the PLN and the pancreatic islets for several weeks (41, 42, 43). Several explanations may account for the onset of diabetes: a reduction in Treg cell number and/or function and an increase in Teff cells coinciding or not with a heightened resistance of diabetogenic T cells to regulation. Our results show that, although d3-Tx resulted in severe T cell lymphopenia, the frequency of Foxp3+ Treg cells among CD4+ T cells was greatly increased and their suppressive activity unchanged. This increase essentially concerned the subset of CD4+Foxp3+CD103+ cells displaying an activated cell phenotype, shown as the most potent subpopulation of Treg cells, efficiently migrating into inflamed sites (24, 25, 26). Despite the large increase in activated Treg cell frequency, gastritis developed. Challenging the view that d3-Tx gastritis resulted from a paucity in Treg cells, Monteiro et al. (44) showed that after their expansion, gastritogenic T cells outnumbered Treg cells, which have become unable to control disease development. These observations, together with the fact that gastritis development requires Tx to be performed before 7 days of age, indicate that LIP of gastritogenic T cells is initiated by self-ligands during the first week of life. One may ask why diabetes is not exacerbated in d3-Tx NOD mice and whether the differential effects of d3-Tx on gastritis and diabetes refer to the initial activation of islet Ag-specific T cells. Although it is established that, following d3-Tx, some peripheral T cells rapidly proliferate, activation of anti-β cell T cells is delayed. Indeed, presentation of islet Ags is inactive during neonatal life. Notably, LIP of NOD.BDC2.5 cells (expressing a β cell-specific TCR) occurs only in the PLN of mice older than 10 days (39, 45). Similar results were found with transgenic cells expressing OVA under the control of the rat insulin promoter (39). Good evidence supports a link between β cell apoptosis and the initiation of autoimmunity. In all mouse strains, a wave of apoptosis occurs during the neonatal period, peaking at 9–15 days, but the clearance of apoptotic debris is decreased in NOD mice (46, 47). This wave provides the autoantigens required for the initial activation of Teff cells (48). Thus, in 3- to 4-wk-old d3-Tx mice, when β cell-specific T cells started to proliferate (39, 40), the size of their pool was still that of neonates. At weaning, lymphopenia was not as severe as in neonates, so LIP was weak, and activation/expansion of islet-specific T cells likely occurred normally under the control of Treg cells. Actually, adoptive transfer of diabetes by spleen T cells, in NOD-scid mice, revealed that the pool of pathogenic T cells was similar in adult d3- and sham-Tx mice. Diabetes was accelerated in wk3-Tx mice (15). In this case, Tx was performed precisely during the initial activation of β cell-specific T cells, and the size of this autoreactive cell population was as large as in sham-Tx mice. Although wk3-Tx induced a moderate lymphopenia, LIP mechanisms engaged, leading to the proliferation of both conventional T and Treg cells (16, 27). Possibly, the environment, thus generated, amplified the chronic activation of β cell-specific T cells, accelerating the production of pathogenic T cells whose number augmented faster than in control NOD mice, causing early β cell destruction and diabetes onset. Indeed, CD62L− T cells from wk-3 Tx mice transferred diabetes more rapidly than CD62L− T cells from sham-Tx mice. This suggests that diabetogenic cells were more numerous and/or more potent in the activated T cell pool of wk3-Tx than of sham-Tx mice. Thus, acceleration of diabetes development in wk3-Tx may have resulted from an inability of Treg cells to control a more numerous/efficient pool of pathogenic T cells. After wk3-Tx, 1) the number of Foxp3+CD4+ T cells was almost identical to that in sham-Tx mice; 2) the frequency of CD103+ Treg cells was largely increased, although less than in d3-Tx; and 3) their suppressive activity, in vivo as well as in vitro, was undistinguishable from that of sham-Tx mouse Treg cells. This sustains the notion that acceleration of diabetes in wk3-Tx mice did not result from a failure of Foxp3 Treg cells, but that wk3-Tx rather impacted on pathogenic T cells. Additionally, that pathogenic T cells became resistant to Treg cell control cannot be ruled out. Indeed, escape of Teff cells to Treg cell control was observed in different situations of autoimmune diabetes in rodent (18, 28) and humans (49). Notably, in the NOD mouse, the increased resistance of Teff to Treg cells with age may involve an overexpression of IL-21 (50) a cytokine critical for diabetes development (13, 51). In summary, the differential effects of Tx at 3 days or 3 wk of age on autoimmune diabetes development appear to be rather linked to the behavior of Teff than of Treg cells. Indeed, fully competent Treg cells were present in both models. The number/pathogenicity of Teff cells was greatly amplified only after wk3-Tx and likely overcame Treg cell control, leading to an early tolerance breakdown. In contrast, in d3-Tx mice, activation of a scarce number of Teff cells at only 3 wk of age slowed down the amplification of Teff cells and diabetes incidence remained unchanged. This work illustrates once more the importance of the first checkpoint in diabetes development (52) and suggests that lymphopenia-induced autoimmunity may require, at least in the NOD mouse model, that thymus ablation and the first encounter of autoreactive T cells with their cognate Ag coincide. We thank André Herbelin for helpful discussions and critical reading of this manuscript and Isabelle Cissé and Laeticia Breton for animal care. ↵1 This work was supported by recurrent funding from INSERM and Centre National de la Recherche Scientifique. ↵3 Abbreviations used in this paper: Tx, thymectomy; NOD, nonobese diabetic; Treg, regulatory T; Teff, effector T; PLN, pancreatic LN; perLN, peripheral LN; MLN, mesenteric LN; d3-Tx, thymectomy at 3 days; wk3-Tx, thymectomy at 3 wk; LIP, lymphopenia-induced proliferation; LN, lymph node; GITR, glucocorticoid-induced TNFR-related protein 1. Baccala, R., A. N. Theofilopoulos. 2005. The new paradigm of T-cell homeostatic proliferation-induced autoimmunity. Trends Immunol. 26: 5-8. Krupica, T., Jr, T. J. Fry, C. L. Mackall. 2006. Autoimmunity during lymphopenia: a two-hit model. Clin. Immunol. 120: 121-128. Le Campion, A., C. Bourgeois, F. Lambolez, B. Martin, S. Leaument, N. Dautigny, C. Tanchot, C. Penit, B. Lucas. 2002. Naive T cells proliferate strongly in neonatal mice in response to self-peptide/self-MHC complexes. Proc. Natl. Acad. Sci. USA 99: 4538-4543. Martin, B., C. Bourgeois, N. Dautigny, B. Lucas. 2003. On the role of MHC class II molecules in the survival and lymphopenia-induced proliferation of peripheral CD4+ T cells. Proc. Natl. Acad. Sci. USA 100: 6021-6026. Min, B., H. Yamane, J. Hu-Li, W. E. Paul. 2005. Spontaneous and homeostatic proliferation of CD4 T cells are regulated by different mechanisms. J. Immunol. 174: 6039-6044. Martin, B., C. Becourt, B. Bienvenu, B. Lucas. 2006. Self-recognition is crucial for maintaining the peripheral CD4+ T-cell pool in a nonlymphopenic environment. Blood 108: 270-277. Surh, C. D., J. Sprent. 2008. Homeostasis of naive and memory T cells. Immunity 29: 848-862. Dujardin, H. C., O. Burlen-Defranoux, L. Boucontet, P. Vieira, A. Cumano, A. Bandeira. 2004. Regulatory potential and control of Foxp3 expression in newborn CD4+ T cells. Proc. Natl. Acad. Sci. USA 101: 14473-14478. Jackson, R., N. Rassi, T. Crump, B. Haynes, G. S. Eisenbarth. 1981. The BB diabetic rat: profound T-cell lymphocytopenia. Diabetes 30: 887-889. King, C., A. Ilic, K. Koelsch, N. Sarvetnick. 2004. Homeostatic expansion of T cells during immune insufficiency generates autoimmunity. Cell 117: 265-277. Berzins, S. P., E. S. Venanzi, C. Benoist, D. Mathis. 2003. T-cell compartments of prediabetic NOD mice. Diabetes 52: 327-334. Dardenne, M., F. Lepault, A. Bendelac, J. F. Bach. 1989. Acceleration of the onset of diabetes in NOD mice by thymectomy at weaning. Eur. J. Immunol. 19: 889-895. Bourgeois, C., Z. Hao, K. Rajewsky, A. J. Potocnik, B. Stockinger. 2008. Ablation of thymic export causes accelerated decay of naive CD4 T cells in the periphery because of activation by environmental antigen. Proc. Natl. Acad. Sci. USA 105: 8691-8696. Greiner, D. L., J. P. Mordes, E. S. Handler, M. Angelillo, N. Nakamura, A. A. Rossini. 1987. Depletion of RT6.1+ T lymphocytes induces diabetes in resistant biobreeding/Worcester (BB/W) rats. J. Exp. Med. 166: 461-475. Gregori, S., N. Giarratana, S. Smiroldo, L. Adorini. 2003. Dynamics of pathogenic and suppressor T cells in autoimmune diabetes development. J. Immunol. 171: 4040-4047. Tritt, M., E. Sgouroudis, E. d'Hennezel, A. Albanese, C. A. Piccirillo. 2008. Functional waning of naturally occurring CD4+ regulatory T-cells contributes to the onset of autoimmune diabetes. Diabetes 57: 113-123. Mellanby, R. J., D. Thomas, J. M. Phillips, A. Cooke. 2007. Diabetes in non-obese diabetic mice is not associated with quantitative changes in CD4+CD25+Foxp3+ regulatory T cells. Immunology 121: 15-28. D'Alise, A. M., V. Auyeung, M. Feuerer, J. Nishio, J. Fontenot, C. Benoist, D. Mathis. 2008. The defect in T-cell regulation in NOD mice is an effect on the T-cell effectors. Proc. Natl. Acad. Sci. USA 105: 19857-19862. Lepault, F., M. C. Gagnerault, C. Faveeuw, H. Bazin, C. Boitard. 1995. Lack of L-selectin expression by cells transferring diabetes in NOD mice: insights into the mechanisms involved in diabetes prevention by Mel-14 antibody treatment. Eur. J. Immunol. 25: 1502-1507. East, J., M. A. De Sousa, D. M. Parrott, H. Jaquet. 1967. Consequences of neonatal thymectomy in New Zealand Black mice. Clin. Exp. Immunol. 2: 203-215. Billiard, F., E. Litvinova, D. Saadoun, F. Djelti, D. Klatzmann, J. L. Cohen, G. Marodon, B. L. Salomon. 2006. Regulatory and effector T cell activation levels are prime determinants of in vivo immune regulation. J. Immunol. 177: 2167-2174. Banz, A., A. Peixoto, C. Pontoux, C. Cordier, B. Rocha, M. Papiernik. 2003. A unique subpopulation of CD4+ regulatory T cells controls wasting disease, IL-10 secretion and T cell homeostasis. Eur. J. Immunol. 33: 2419-2428. Siewert, C., U. Lauer, S. Cording, T. Bopp, E. Schmitt, A. Hamann, J. Huehn. 2008. Experience-driven development: effector/memory-like αE+Foxp3+ regulatory T cells originate from both naive T cells and naturally occurring naive-like regulatory T cells. J. Immunol. 180: 146-155. Tang, Q., J. A. Bluestone. 2006. Regulatory T-cell physiology and application to treat autoimmunity. Immunol. Rev. 212: 217-237. Le Campion, A., M. C. Gagnerault, C. Auffray, C. Becourt, M. Poitrasson-Riviere, E. Lallemand, B. Bienvenu, B. Martin, F. Lepault, and B. Lucas. 2009. Lymphopenia-induced spontaneous T-cell proliferation as a cofactor for autoimmune disease development. Blood DOI 10.1182. La Gruta, N. L., I. R. Driel, P. A. Gleeson. 2000. Peripheral T cell expansion in lymphopenic mice results in a restricted T cell repertoire. Eur. J. Immunol. 30: 3380-3386. Mackall, C. L., C. V. Bare, L. A. Granger, S. O. Sharrow, J. A. Titus, R. E. Gress. 1996. Thymic-independent T cell regeneration occurs via antigen-driven expansion of peripheral T cells resulting in a repertoire that is limited in diversity and prone to skewing. J. Immunol. 156: 4609-4616. Suri-Payer, E., P. J. Kehn, A. W. Cheever, E. M. Shevach. 1996. Pathogenesis of post-thymectomy autoimmune gastritis: identification of anti-H/K adenosine triphosphatase-reactive T cells. J. Immunol. 157: 1799-1805. Garza, K. M., S. S. Agersborg, E. Baker, K. S. Tung. 2000. Persistence of physiological self antigen is required for the regulation of self tolerance. J. Immunol. 164: 3982-3989. Tung, K. S., S. Smith, C. Teuscher, C. Cook, R. E. Anderson. 1987. Murine autoimmune oophoritis, epididymoorchitis, and gastritis induced by day 3 thymectomy. Immunopathology. Am. J. Pathol. 126: 293-302. Hoglund, P., J. Mintern, C. Waltzinger, W. Heath, C. Benoist, D. Mathis. 1999. Initiation of autoimmune diabetes by developmentally regulated presentation of islet cell antigens in the pancreatic lymph nodes. J. Exp. Med. 189: 331-339. Gagnerault, M. C., J. J. Luan, C. Lotton, F. Lepault. 2002. Pancreatic lymph nodes are required for priming of β cell reactive T cells in NOD mice. J. Exp. Med. 196: 369-377. Chen, Z., A. E. Herman, M. Matos, D. Mathis, C. Benoist. 2005. Where CD4+CD25+ Treg cells impinge on autoimmune diabetes. J. Exp. Med. 202: 1387-1397. Monteiro, J. P., J. Farache, A. C. Mercadante, J. A. Mignaco, M. Bonamino, A. Bonomo. 2008. Pathogenic effector T cell enrichment overcomes regulatory T cell control and generates autoimmune gastritis. J. Immunol. 181: 5895-5903. Trudeau, J. D., J. P. Dutz, E. Arany, D. J. Hill, W. E. Fieldus, D. T. Finegood. 2000. Neonatal β-cell apoptosis: a trigger for autoimmune diabetes?. Diabetes 49: 1-7. Kurrer, M. O., S. V. Pakala, H. L. Hanson, J. D. Katz. 1997. Beta cell apoptosis in T cell-mediated autoimmune diabetes. Proc. Natl. Acad. Sci. USA 94: 213-218. Mintern, J. D., R. M. Sutherland, A. M. Lew, K. Shortman, F. R. Carbone, W. R. Heath. 2002. Constitutive, but not inflammatory, cross-presentation is disabled in the pancreas of young mice. Eur. J. Immunol. 32: 1044-1051. Schneider, A., M. Rieck, S. Sanda, C. Pihoker, C. Greenbaum, J. H. Buckner. 2008. The effector T cells of diabetic subjects are resistant to regulation via CD4+FOXP3+ regulatory T cells. J. Immunol. 181: 7350-7355. Clough, L. E., C. J. Wang, E. M. Schmidt, G. Booth, T. Z. Hou, G. A. Ryan, L. S. Walker. 2008. Release from regulatory T cell-mediated suppression during the onset of tissue-specific autoimmunity is associated with elevated IL-21. J. Immunol. 180: 5393-5401. Spolski, R., M. Kashyap, C. Robinson, Z. Yu, W. J. Leonard. 2008. IL-21 signaling is critical for the development of type I diabetes in the NOD mouse. Proc. Natl. Acad. Sci. USA 105: 14028-14033. Andre, I., A. Gonzalez, B. Wang, J. Katz, C. Benoist, D. Mathis. 1996. Checkpoints in the progression of autoimmune disease: lessons from diabetes models. Proc. Natl. Acad. Sci. USA 93: 2260-2263.